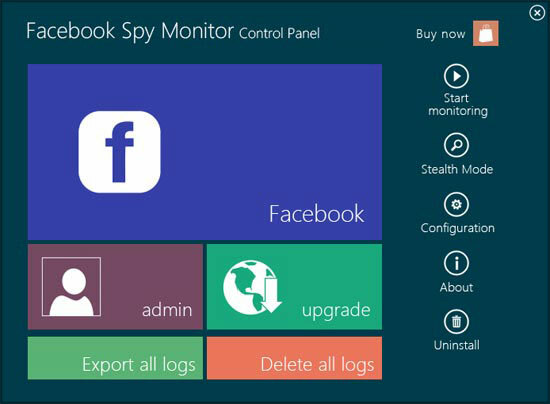 Description: Facebook Spy Monitor is a Facebook profile monitoring and parental control software. It secretly records PC users' Facebook private profile, emails, chats & IMs, photos, interests, contatcts and events by taking screen snapshots periodically. It also records popular Facebook instant messenging clients and Facebook related web sites and searches. See exactly what users were doing just like watching a surveillance video playback. Description: PC Pandora is your very own personal PC and Internet detective that hides on your hard drive and monitors all computer and Internet activity. Record and take snapshots of the websites visited, emails sent and received, Instant Messages sent and received, Chat room conversions and other computer and Internet activity that is done on your PC. PC Pandora stays completely hidden, records all secret passwords and allows for easy, VCR-like playback. Description: Keylogger Spy Monitor spy software can secretly record all keystrokes typed on your computer. It runs completely invisiblely. You can check logging reports by simply receiving emails or opening a web page. Perfect for catching cheaters, m onitoring employees, children or spouse, acquiring others' passwords and even investigating crimes. Use hotkey to unhide it from Stealth Mode and protect the program access by password. Description: PC Screen Spy Monitor software secretly caputres your computer screen. It is like a invisible surveillance camera aimed directly at your PC screen. It records a screenshot every X seconds (adjustable) without being detected. This captures all activity performed on your PC, no matter who performs it! You can view the screenshot images taken directly from the embedded image / slideshow viewer. Description: Power Spy secretly logs Facebook, Skype, keystrokes, chats & IMs, emails, web visits, video talk, microphone, logins, passwords, applications, searches and more. It also takes screenshots like a surveillance camera. Lets you know exactly what they do on a computer screen while you are away. Automatically sends log reports to your email or ftp. Starts monitoring with system startup. Runs silently and invisibly. Description: Power Spy secretly logs Facebook, Skype, keystrokes, chats &amp; IMs, emails, web visits, microphone, video talk, logins, passwords, applications, searches and more. It also takes screenshots like a spy camera. Automatically sends logs to your email. Description: Power Spy Lite secretly logs Facebook, Skype, keystrokes, chats & IMs, emails, web visits, video talk, logins, passwords, applications, searches and more. It also takes screenshots like a surveillance camera. Lets you know exactly what they do on a computer screen while you are away. Automatically sends log reports to your email. Starts monitoring with system startup. Runs silently and invisibly. Description: Power Spy x64 secretly logs all Facebook, keystrokes, chats, emails, web visits, web cam images, user names, passwords, searches, microphone and more. It supports Windows Live Messenger, Skype, Yahoo Messenger, and other IMs. It sends log reports to your email or ftp. You can check logs on another PC or your cell phone. Perfect for catching cheaters, monitoring employees, children and spouse and even investigating crimes.